A sabotaged plane. Two dead deep-water divers. Bailey Craig vowed never to set foot in Yancey, Alaska, again. She has a past, and a reputation–and Yancey’s a town that doesn’t forget. She’s returned only to bury a loved one killed in the plane crash, but then dark evidence emerges and Bailey’s own expertise becomes invaluable for the case. Cole McKenna can face dangerous rescue dives. He can face the fear a murderer may be threatening his town. But facing the reality of Bailey’s reappearance is a tougher challenge. She broke his heart…but doesn’t seem to be the same girl who left Yancey ten years ago. And he’s not the same guy she left behind. Racing against the clock and a rising body count, Bailey and Cole must move beyond the hurts of their pasts to work together until the truth of what is hidden in the depths finally surfaces. 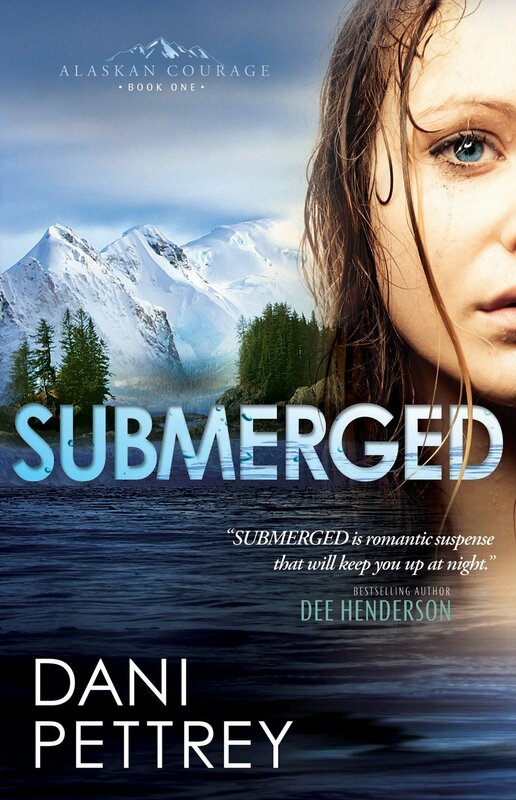 Submerged is the first book in Dani Pettrey’s Alaskan Courage series and a great beginning to a fantastic series! The action begins on the very first page and continues throughout the book. From murder and mystery to secrets and surprises, this book has it all! In leaving Yancey, Alaska, ten years ago, Bailey Craig tried to move beyond the mistakes of her past. However, they still linger in her mind and in the mind of others. In searching for answers to mulitple murders and mysteries, Bailey finds the ultimate truth! Cole McKenna has remained in the small-town of Yancey and never forgotten Bailey Craig. As they work together, feelings old and new begin to stir. The endearing McKenna family quickly brings Bailey into their fold and she begins to realize the meaning of forgiveness. Together, Bailey and Cole not only navigate the waters of Alaka, but also those of forgiveness, letting go, and beginning anew! While Submerged primarily focuses on the realationship between Bailey and Cole, its cast of characters is vast and rich. Grab a copy of Submerged today and meet the wonderful people of Yancey, Alaska! Be sure to come back Friday for some exciting news concerning this series! Dani Pettrey is a wife, homeschooling mom, and author. She feels blessed to write inspirational romantic suspense because it incorporates so many things she loves–the thrill of adventure, nailbiting suspense, the deepening of her characters’ faith, and plenty of romance. She and her husband reside in Maryland with their two daughters. How exciting!!!! Can’t WAIT for the next releases!!! Still need to read Stranded, however that won’t be dragging out 🙂 Out of the first two, Shattered is probably my favourite, but probably only because I read Submerged and fell in love with the family.